The Marlborough and Nelson region, at the top of the South Island, has a diverse palette of natural resources, offering a popular destination for tourists. The Marlborough Sounds is really paradise: fishing, boating, hiking, mountain biking and relaxation are all on the menu. Do not forget to book your accommodation in advance (especially in January and February). 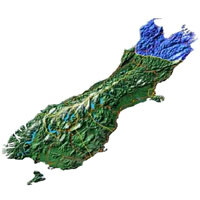 The mild climate of the Nelson region is ideal for the production of fine wine. Arts and crafts, fine dining, outdoor activities, and beautiful beaches are all features of this region. An established guiding service (est. 1990) with a dedicated guide who is passionate about providing an exceptional New Zealand fly-fishing experience. Our base is situated adjacent to the Nelson Lakes National Park (100kms south of Nelson) - fishing 25 local rivers - access either by 4WD vehicle or helicopter. Wilderness overnight campouts - the ultimate NZ fly fishing adventure. Come and explore the beautiful Abel Tasman National Park and stay in boutique accommodation with amazing views at Awatea Tasman Bay. Accommodation, and guided day walks into the beautiful Abel Tasman National Park. Accommodation, guided walk, and kayak packages available staying at our Riwaka Retreat near Motueka - including visiting our historic 'kiwi' bach in the Park. Small groups, local stories, friendly guides. Join one of our small groups or have your own guide on a personal guided walk. Kahurangi National Park is New Zealand's second largest and most diverse park. Many of the features seen in Kahurangi are unique to this country. Because of Kahurangi's diversity, we have many trips to choose from—each of them very different from the other. There is something for all ages and fitness levels. From day walks to comfortable cottage accommodation with multi-day walks with day packs only, through to off track wilderness backpacking. WINTER RATES,1 - 4 day all inclusive guided walks on New Zealand's premier trail, The Queen Charlotte Track. Luxury accommodation, fine dining and spectacular scenery awaits. Includes luggage transfers, all meals and accommodation, informative local guides, optional sea kayaking and hotel transfers. Perfect for couples where one may wish to walk while the other travels to each lodge by water taxi. Scenic flights in a floatplane covering all the Marlborough Sounds, Abel Tasman national park, Wellington and Nelson, landing and taking off the water is a thrill not to be missed , adda landing at a Hotel and have some lunch, fly back to Picton or stay the night. Queen Charlotte Wilderness Park is a boat only reachable peninsula in the Outer Queen Charlotte Sound. There a visitor can experience the joy of living in harmony with nature to which the Park is now dedicated as well as enjoy the many activities that we have available. Beachcomber Cruises Picton are the Marlborough Sounds cruise transport and Queen Charlotte Track specialists. Family owned and operated we are also the operators of the famous Magic Mail Run, the only NZ post licensed delivery service in the Queen Charlotte Sound. We offer sightseeing cruises, Queen Charlotte Track transfers, one day and multi day cruise and walk packages as well as Marlborough Sounds lodge transfers. Open for business 364 days of the year from the Picton waterfront. Escape Adventures is a full-service bike company based in beautiful Golden Bay. We offer mountain bike tours, bike hire and MTB shuttles on the Heaphy track, Rameka track and other Nelson and Golden Bay tracks along with cycle tours on the Nelson-Tasman Great Taste Trail. Caroline Easther steps out from behind her beloved drum kit to sing songs from her new indie-pop album 'Lucky'. She will be backed by her band The Cinnamon Girls. The Roadhouse Breakfast is for car enthusiasts of all genres. Held the first Sunday of every month at the Riverlands Roadhouse. Coffee cart on site and the cafe serves great food. Over 100 cars at each of first two events.